Tickets are $5 for KCC students and employees and $10 for the general public, and may be reserved in advance by calling 269-965-4154. The plot revolves around a sweet teenage girl named Toffee and her rebellious boyfriend Jonny, who drives his motorcycle into a nuclear cooling tower after Toffee breaks up with him. Toffee is guilt ridden and alone until Jonny returns, risen from the dead – as a teenage nuclear zombie with plans to take her to the prom. The musical opened Off-Broadway in the mid-1990s and was later adapted into a short film. 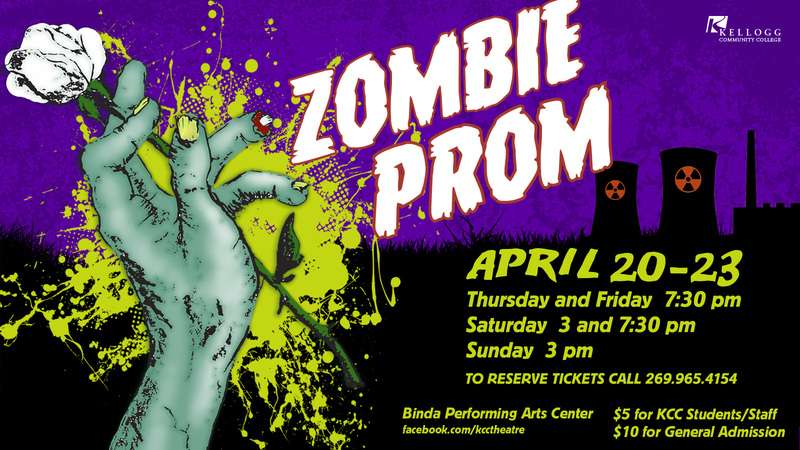 For more information, contact KCC Theatre professor and “Zombie Prom” director Brad Poer at poerb@kellogg.edu.